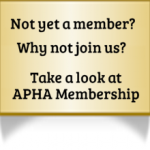 If you are not yet an APHA member, please join us! You can log-in to your membership which just might give you access. You can hit the BACK button on your browser to go back to where you came from. Send a quick email ( info@aphadvocates.org ) if you think this is an error. We'll try to help you figure it out.